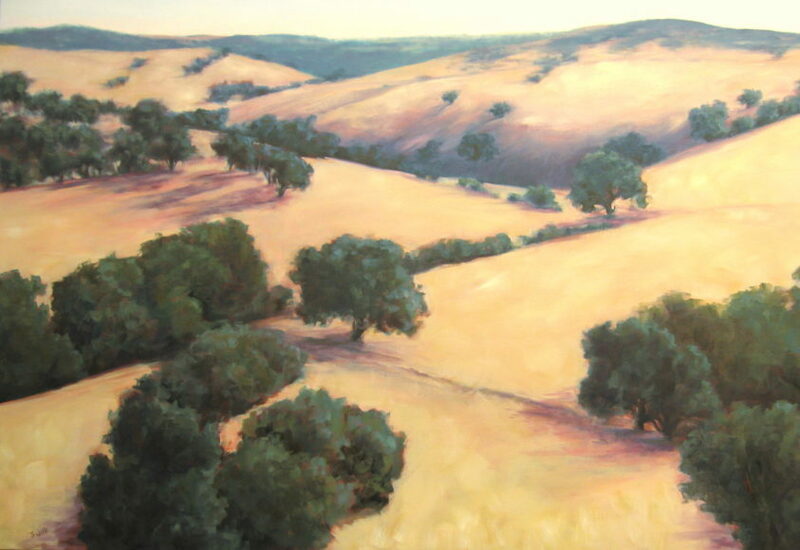 Silvia Trujillo paints the landscapes and scenery of Southern Oregon. Applied in oils, using an impasto technique, her paintings communicate mood with a sense of time by coloring the light and shadow of each season. Silvia exclaims, “I live, breathe, and sleep art. Creating art is a way of life for me, and I consistently produce paintings that express a deep regard for nature. Landscape painting is a natural extension of this love and it attracts me to the dramatic light that occurs during a storm, or at dawn or dusk, and my goal is to honor land, water, and sky in these works and help to create the need for preserving an area’s natural beauty. I believe that my art appeals to those who share the same sentiments and to anyone with an appreciation of nature, color, and light. As a painting/drawing instructor for over 25 years, it also brings me great joy to know that I’ve inspired and fostered expert work in many others over the years. I believe that my art appeals to those who share the same sentiments and to anyone with an appreciation of nature, color, and light.” This exposition on display in our new location: 42 East Main Street, Ashland, OR. For more information, call 541-941-0855, and follow us on Facebook. Artwork displayed throughout May, 2018.